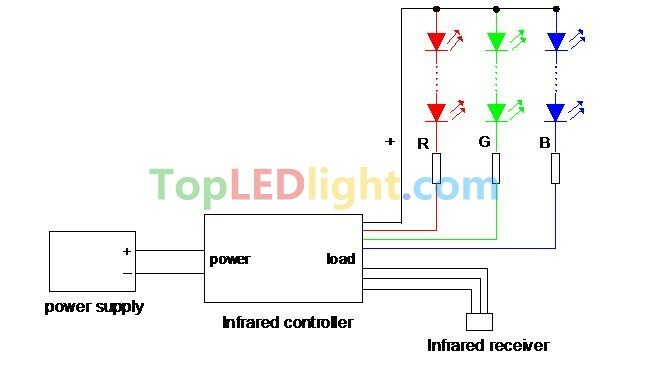 44-key infrared controller adopts the advanced micro control unit, it is used for controlling a variety of lamp whose source of light is LED. 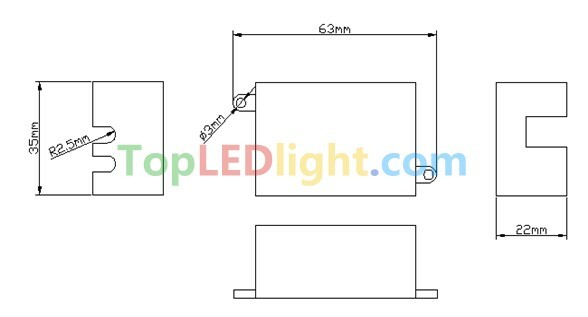 For instance, point source of light, flexible light strip, wall washer lamp, glass curtain wall light and so on; it has many advantages such as low price, easy connection and simplicity to use. Meanwhile, you could adjust brightness, static color choices and various dynamic changes in lighting effects through infrared remote control. Besides, you also could adjust random color by yourself freely. 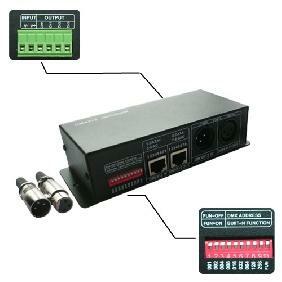 Adopt conventional power Transposon as a DC power input interface. Adopt oblate three-way wire，and connect an infrared receiver to receive an external infrared. 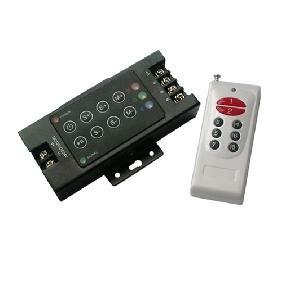 the Remote Control can operate on more than one Control Box. 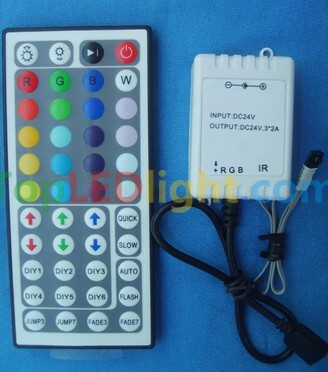 I ordered a set of rgb lights with a power supply, a remote, an IR receiver and this extra Remote/receiver pack. I intend to cut my strip in half and use a power supply that I found at the swap meat so that I have two fully independent half strips of about 7.5 feet each. I received the bigger remote pictured in the description, which I quite enjoy. The colors are not all true and the white is a little blueish, but the peach setting right below it makes for a pretty good light. I use it to light up my whole room from a ledge above my window. The customizable light settings (DIY1-DIY6) are fun to play with because you can adjust RGB to your desire, but they are considerably more dim than the preset colors, of which there are twenty. The fades can be slowed down for good mood lighting and the jump settings are good for freaking out friends. Also, the remote is IR, so the remote must be pointed at the receiver. It does have considerable range though (I\'ve tried 40 feet). Overall, an exellent product for the price but there are some kinks. 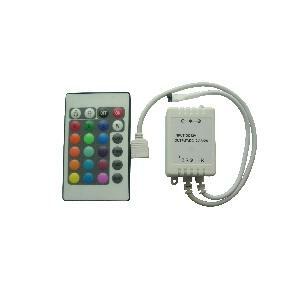 I bought this to control under cabinet white LED lights. I was at first puzzled that the controller had a male connection, but it was a male pin adapter that can be removed leaving the female connector that I was expecting from the photos. Since it is for a single strip of white lights with 2 connectors, use the outer two pins for your connection, that way if for some reason, you get it backwards, you can reverse the plug and it will be correct. This unit seems to work better than the $5 controller that burned out on me. 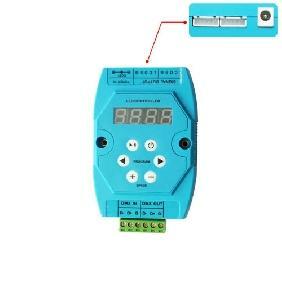 Great device for controlling a 5050 style LED strip. Priced well, works perfectly. Like the 6 DIY setting to create your own colors and brightness. You can get a perfect warm white color out of the strip that way. 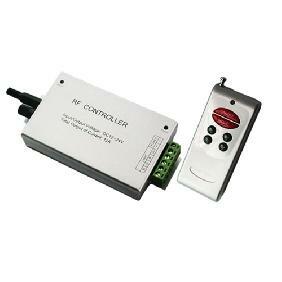 I was looking for something to control the lights i wanted to put behind my TV. Everything i found was soooo darn expensive and did way more then i needed. I looked on all the usual sites and this was the only place i found that had what i wanted. This little guy was very easy to wire up. I ended up opening the control box and directly connecting to the board inside for a cleaner look. Likes? Cheap! Easy! Does what it says! Easy to operate(my kids love it) Dislikes? hmmm lemme think.... It wasnt free? I dont dislike any of it! In fact im going to buy a few more to use on other projects. We got this controller for a party.While we didn\'t like the lights very much, this little controller is a superb toy for the money.This isn\'t a digital controller that can individually address LED\'s - It is designed to work with strips that have all the LED\'s connected in parallel.The IR receiver (the blob on the end of the thin wire) is sensitive and seems to work no matter where you point the remote, within reason.The little white box is small enough to be stashed away out of site.It works by sending a different voltage to each of the red, green, blue LED segments which in turn varies the brightness of each color. The result is pretty much any color you can be bothered to dial in.... it takes a little patience.You can choose from pre-set colors (the colored buttons you see), a color you have saved to memory or you can set any red, green, blue level (the arrow buttons you see).It can flash on & off, vary the speed, fade into the next color... all sorts of nifty effects.Ridiculously cheap for what it does but comes without a power adaptor. I used a universal laptop supply. Worked great. To start things off, the package arrived almost 2 weeks before the estimated delivery time frame. 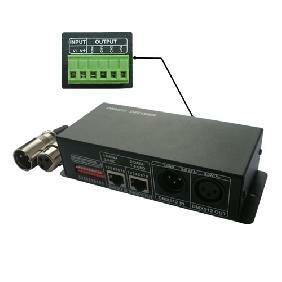 I bought this with a 1 meter led strip (1m 5050 RGB SMD LED Strip Waterproof 12v 60leds/m Flexible) and it works amazingly! 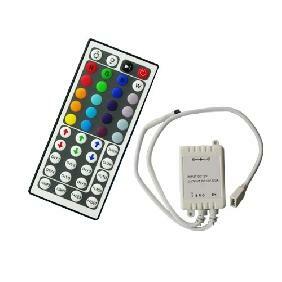 All the colours work as said on the remote (the leads were not flipped as some other reviewers have seen). There are so many more functions with this than I expected. The box saves the last used light pattern for when you start it up, stores six custom colours, and can adjust the brightness of it all (excluding the 3 & 7 colour fade and flash options). 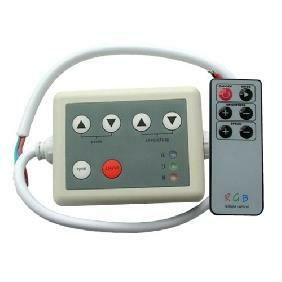 44 Keys DIY Infrared IR Remote Controller Common Anode/Common Cathode Rating: 5 out of 5 based on 8 reviews.